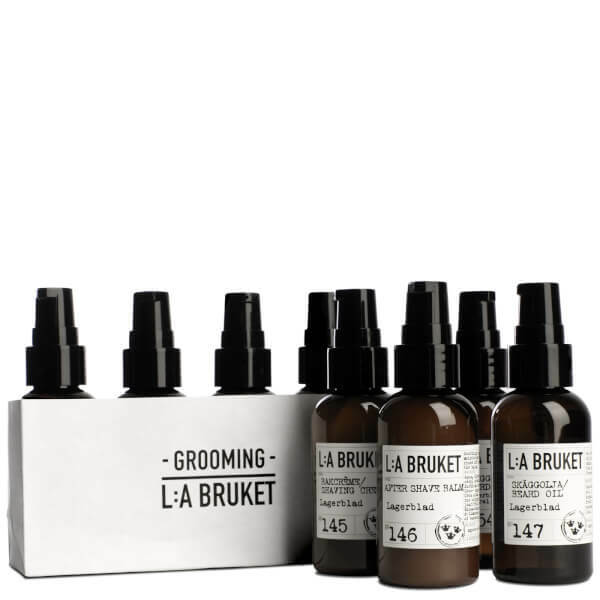 Swedish brand L:A BRUKET present the No. 166 Grooming Kit; a four-piece set to keep beards feeling tamed, nourished and conditioned. Utilising natural and organic ingredients, it’s the perfect gift for any well-groomed gentleman. The gentle shaving cream ensures a smooth, effortless shave, allowing the blade to glide evenly across skin for a clean finish. Enriched with moisturising Shea Butter and lubricating vegetable Glycerin, it reduces friction and alleviates irritation, while essential oils from Laurel Leaf provide cleansing and bacteriostatic benefits. The aftershave balm hydrates and protects skin, helping to soothe and minimise the effects of shaving including redness and inflammation. Fortified with deeply nourishing Shea Butter, it softens and moisturises skin while the addition of Mint and Laurel Leaf Oils soothe, cool and refresh. Keep your beard in tip top shape with this gentle wash. Carefully balancing Witch Hazel and Chestnut extracts, it sweeps away dirt and impurities while conditioning the hair for a smooth, soft finish. Complete with anti-sceptic Cedarwood and Laurel Leaf Oil for a clean, refreshed and refined beard. The concentrated oil softens hair and skin, helping to detangle and tame for enhanced styling and manageability. A harmonic blend of Jojoba, Argan and Hemp Oils work in synergy to strengthen and soften individual hairs, while Vitamin E promotes healing and regeneration. The finishing touch for a groomed and well-kept beard. Shaving Cream: Aqua, Behentrimonium Methosulfate, Cetearyl Stearate, Caprylic/Capric Triglyceride, Peg-20 Stearate, Cetyl Alcohol, Dodecane, Simmondsia Chinensis Seed Oil, Prunus Amygdalus Dulcis Oil, Coco-Caprylate/Caprate, Citrus Aurantium Bergamia Fruit Oil, Allantoin, Juniperus Virginiana Oil, Pimenta Racemosa Leaf/Fruit Oil, Potassium Sorbate, Sodium Benzoate, Butylene Glycol, Sodium Phytate, Citric Acid, Maltodextrin, Beta Glucan, Phenoxyethanol, Benzoic Acid, Dehydroacetic Acid, Ethylhexylglycerin And Linalool, D-Limonene, Eugenol (Natural Ingredients Of Essential Oils). Shave Balm: Aqua, Glycerin, Glyceryl Caprylate, Cetearyl Alcohol, Glyceryl Stearate Citrate, Caprylic/Capric Triglyceride, Sorbitan Stearate, Butyrospermum Parkii Butter, Dodecane, Coco-Caprylate/Caprate, Benzyl Alcohol, Cetyl Alcohol, Cera Alba, Citrus Aurantium Bergamia Fruit Oil, Juniperus Virginiana Oil, Tocopherol, Allantoin, Pimenta Racemosa Leaf/Fruit Oil, Xanthan Gum, Salicylic Acid, Sorbic Acid, Biosaccharide Gum-1, Sodium Anisate, Sodium Levulinate And D-Limonene, Eugenol, Linalool, Citral (Natural Ingredients Of Essential Oils). Beard Oil: Carthamus Tinctorius Seed Oil, Simmondsia Chinensis Seed Oil, Cannabis Sativa Seed Oil, Raphanus Sativus Seed Oil, Argania Spinosa Kernel Oil, Citrus Aurantium Bergamiafruit Oil, Tocopherol, Juniperus Virginiana Oil, Pimenta Racemosa Leaf/Fruit Oil And D-Limonene, Eugenol, Linalool, Citral (Natural Ingredients Of Essential Oils).